I am always grateful for those willing to share memories with me that give a glimpse of the past. The following story takes us back to a time when even something as simple as molasses came by hard work. 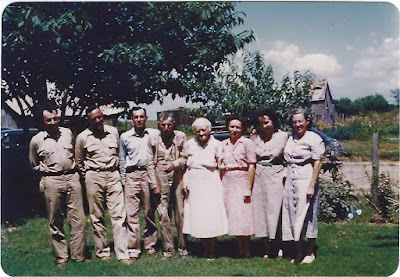 Thank you, Floyd Ganus, descendant of Robert Lee Ganus and Stella Montgomery for sharing the following memory of your Grandpa and Grandma Ganus and how you learned to make sorghum molasses the old way . 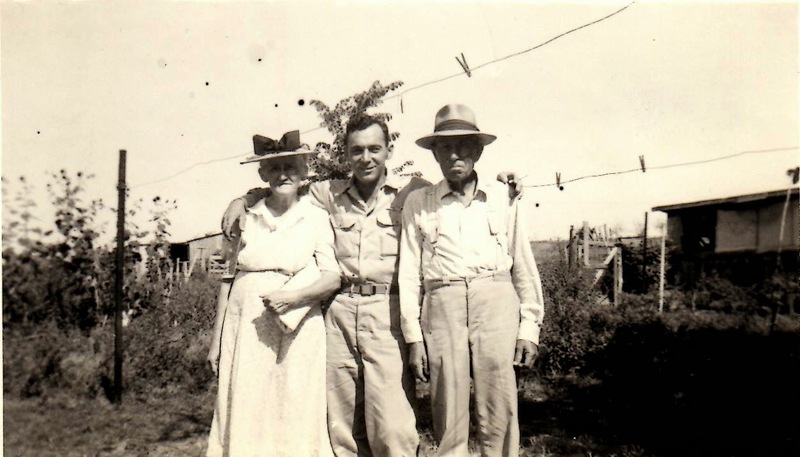 "We lived about a mile west of Grandpa (Robert Lee Ganus) and Grandma’s(Stella). Across the road and about an 1/8 mile up the hill lived Uncle Floyd & Aunt Jean. They had two girls Roberta, a year older and Olivia about 3 years older. There for a spell we didn’t have a car, electricity, or a radio so our entertainment was to walk up the hill and visit them. Also, we were dependent on them to take Mother or Dad to the grocery store. I was 3 or 4 and had an older sister, Virginia, 5 years older and a brother Robert D. 2 years older. "This particular place was on a sandy creek bottom and Dad (Robert O.) Decided it would be a good place to grow sweet potatoes and sugar cane. They both did pretty well and my older years I have regained my taste for sweet potatoes. The sugar cane was a big summer treat to us kids. Mother (Edith P.) Would cut a stalk, clean off the leaves, and cut away the outside stalk and give us the sweet core to eat on. The core was mushy with sugar water and thus delicious to us kids. So for that summer we had the equivalent of a candy bar for several times , a real treat since store bought candy was unknown to us. "When early fall came Dad gathered all of the sugar cane by cutting them off at ground and stripped off the leaves. When he finished with plot, less than an acre, we had a wagon load of sugar cane. Since our transportation was a wagon drawn by a team of horse, we got up early in morning and took the trip about 2 and one-half miles west to the old black mans place to squeeze the canes for the juice. The press was a metal contraption about the size of washing machine with a pole extending from the top to the side 15 or 20 feet. He had a donkey trained to walk the circle around the press giving it power. His was a very slow walk. The old man sat on the ground next to the press and fed the stalks into the press. My brother and I found out why we were invited on this trip. We were the carriers of the sugar cane stalks from the wagon to the old man feeding them in. You had to duck under the pole to hand him the canes. The process of extracting the nectar took about 2 hours or so. Time goes fast when you are having fun- I mean working. When we left the old man kept all of the sugar cane juice and kept it for the final tasks of cooking it down into molasses. "By the time it was ready, we had moved about a mile or so on the other side of Grandpa and Grandma’s. Also, I guess Dad got good prices for those sweet potatoes since he now owned an old pickup truck. He came in one day with several jugs of dark molasses for us. Dad loved molasses and an evening supper would often be pancakes and molasses. Us kids would beg Mom into making home made the syrup by boiling some sugar in some water and adding maple favoring. This was much better than the strong tasting molasses. With so much molasses and reluctant eaters part of the molasses turned into sugar (looked like dark brown sugar). Thank goodness!" Times certainly have changed and I for one am grateful that when I need molasses for a recipe, I can grab a bottle from the grocery shelf .Thank you Floyd, for sharing memories from your childhood years and teaching me about the process of making sorghum molasses the old way! 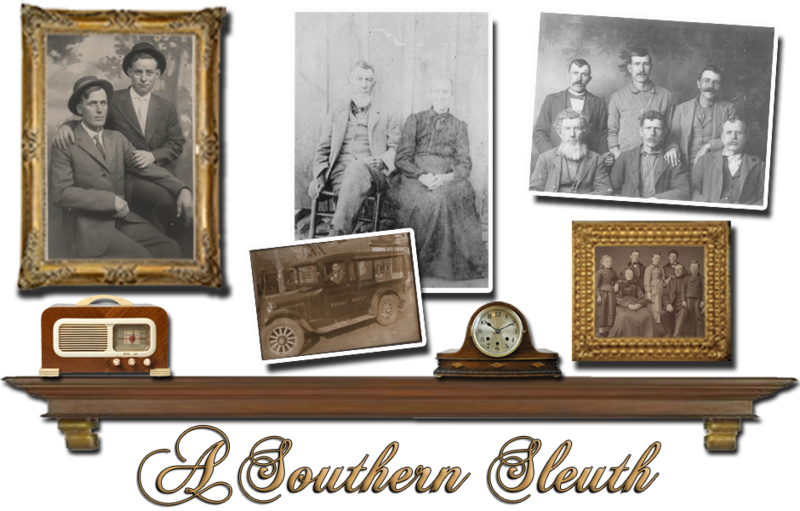 How well do you really know your ancestors? Were they quiet or chatty? Did they drink something special before retiring at night? Were they honest? What were their beliefs on the issues of the day? While so much can be gleaned from governmental records, nothing quite compares to the recollections of those who actually knew them. A journal, letters, or another's remembrances can provide a unique glimpse into an individual's life that no record can provide. 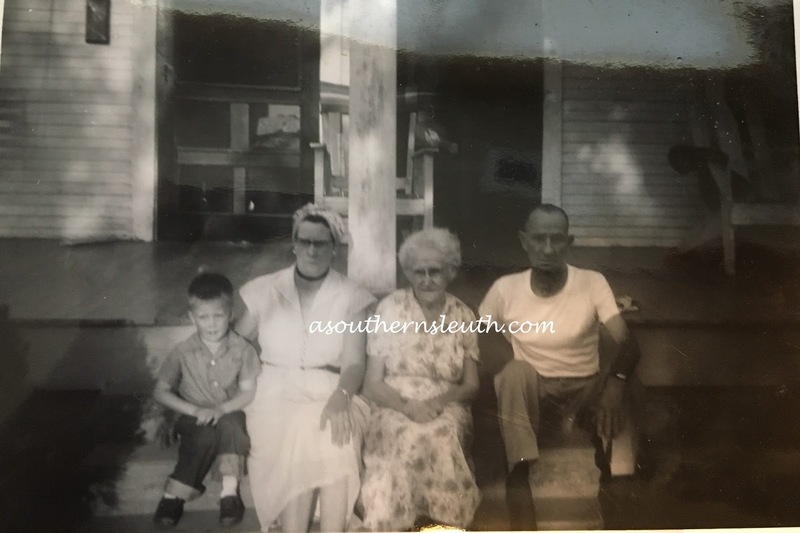 I recently connected with descendants of Robert Lee Ganus, my great grandfather's youngest brother. What a treat to find living people who knew him and were willing to share what they remember about their grandfather. Thank you Floyd Ganus, Mary Tedder and Dorothy Davis! My next few posts will be memories they have generously shared about their grandfather, Robert. 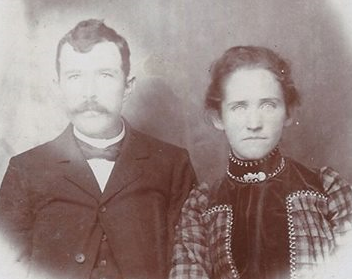 "Robert Lee Ganus was born May 29,1870, to parents John Monroe Ganus and Olivia Rainwater in west central Georgia, Polk County. He was the youngest of six sons who lived to adult age. He lived and migrated with his parents to Colorado and then to the Creek Nation capital known as Okmulgee, a place the Creek Native Americans chose as their government resettlement since they believed no tornado would strike this town and it was adjacent to Deep Fork River. "Robert worked for a period as a laborer, possibly as a farm hand, and saved the earnings to purchase 80 acres of farmland from Cecilia Berryhill, a relative of the Creek Native American Chief in the late 1890's. This farm was to be his livelihood and home for the remainder of his life. Initially the cash crop was cotton, but peanuts were grown later. Almost half was dedicated to a cow pasture and most of the crops were corn and head-feed for the chickens, pigs and cows. The majority of food came from a large garden. Pork was a staple since it could be saved via salt injections. A more detailed description is contained in a later description of the farm. "At the age of 30 he courted Stella Mae Montgomery, age 21. She lived with her parents two miles west and one mile south from his farm. 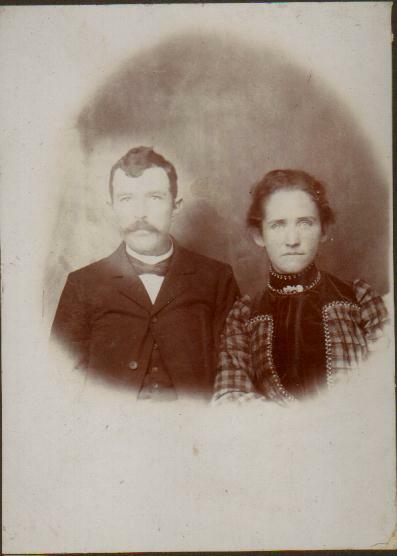 They were married July 8, 1900. They had 8 children, 2 died as infants and 6 who lived to raise their own families. Mary Olivia (Shepperd) b. July 30, 1902: Stella Jane (Mitchel) b. February 27, 1904; Ida Mae (Shaw) b. September 27, 1907; Robert Orvil b. September 12, 1910; Floyd Otto b. April 6, 1913; Andrew Monroe b. April 14, 1917. The first born, a girl Jessie, and fourth born, a girl Lola, died as infants. These six children had 22 grandchildren. All six of these children remained close even after they started their own families. Olivia Shepherd and Ida Mae Shaw continued to return each July 8th for a family reunion after their husbands work had moved them to Texas. The other four continued to live within five miles." Return next week for part 2 when Floyd, Dorothy and Mary share more memories about Robert's life. I have never known anyone who hijacked anything, so when Mary said she remembered the day her grandpa hijacked the car, she had my full attention. 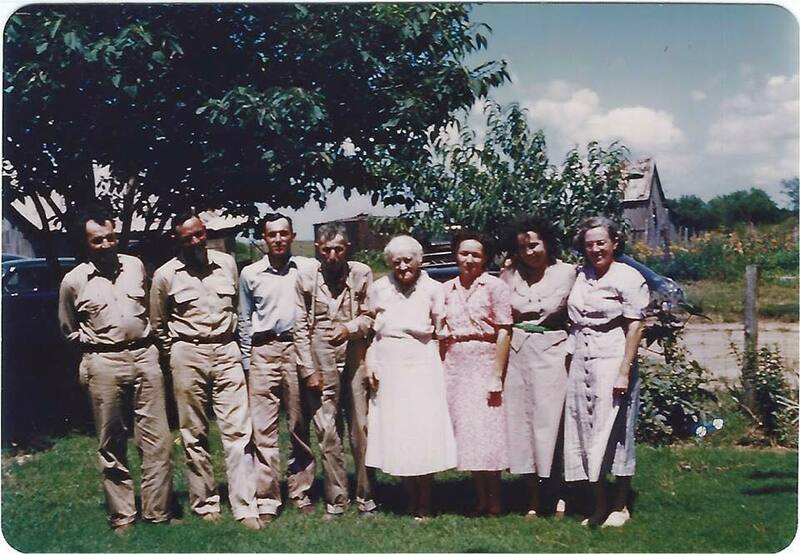 A few months ago I decided to round up descendants of John Monroe Ganus in a Facebook group. I am a member of several Facebook family groups and have enjoyed the association. The results of such groups seems to vary, but I was hopeful that this one would prove successful. Over the years I have been in touch with a few distant Ganus cousins, but I didn't expect that there would be very many on Facebook. As I've shared many times on this blog, my grandfather was orphaned at 8 and sent from Oklahoma where the Ganus family was living to Colorado to live with his mother's family, so I didn't grow up near any of my Ganus cousins and have never met any of them in person. While initially the group was composed of just a small handful of cousins, and I do mean a small handful, word soon spread, and the cousins I contacted began to tell other Ganus cousins and soon our group began to grow and so did the online chatter. 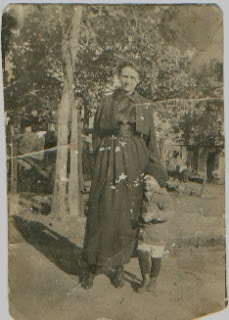 Mary Jo Shaw Tedder, the granddaughter of Robert Lee Ganus is one of my newly discovered cousins. 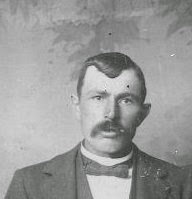 Robert Lee Ganus was born 29 May 1870 in Polk County, Georgia to John Monroe Ganus and Olivia Rainwater. 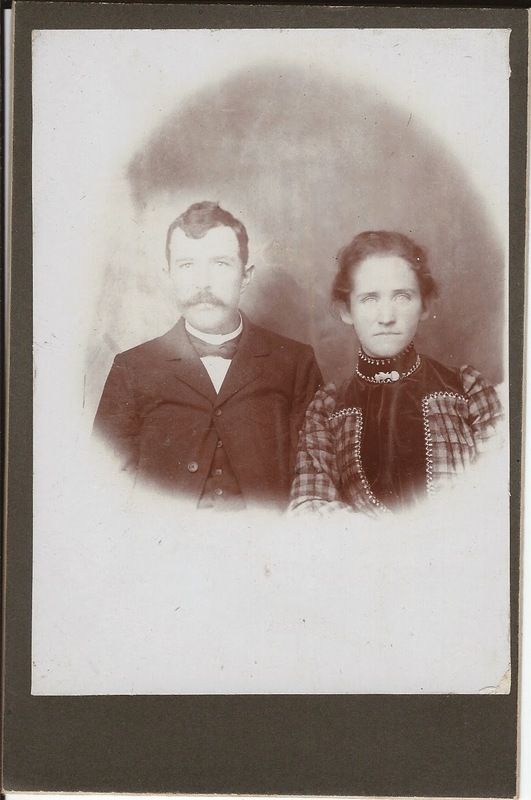 He married Stella May Montgomery 8 July 1900 in Indian Territory, Creek Nation, Oklahoma. He was the youngest of John and Olivia's children and 17 years younger than their eldest child, my great grandfather William Franklin Ganus. Mary has a delightful talent for writing and sharing her memories. When she shares a story, I feel that I am right there with her. With permission I want to share a memory that she recently shared with our group. I will have to start by confessing that the title was a bit of a tease. He didn't really hijack the car. It was his car but the other adults in the family much preferred he didn't drive it. We're talking early 30's and no particular skills were required it seems - and no driver's licenses. I was about 5 years old which meant there weren't more than 5 other grandkids in the area - all of us outside of course. My Aunt Olivia was a pretty "together" person so I was rather startled when she came running out the back door yelling - yes she was yelling - "gather up the kids and get them in the house. Papa's gonna drive the car." Kids were quickly gathered up and moved to a safe place. Grandpa came marching (I always think of him as marching rather than walking or strolling) out of the house and headed for the car. He got it started, ground the gears and lurched toward the road. It's true all the kids were safely in the house or the fenced in yard but the chickens were on their own. There was much squawking and running and I swear some of them tried to fly to get out of the way of that car. Grandpa didn't seem to notice. He got to the road, turned left and lurched away. The end of the story is anti-climatic I guess. He did come back and I never knew where he went or why. I sometimes wonder if those chickens were traumatized and unable to lay eggs at least for a few days. I have laughed and laughed at this story. Thank you Mary for sharing your fun recollection! From the description of Robert marching out to the car, to the kids scattering and the chickens squawking, I can envision it all. It's only been a couple of months since the group was first formed, but what a joy it has been already! We have laughed together and felt touched by the many photos and memories that have been shared. I am amazed at how quickly things have come together and how much it has already blessed my life by helping me become acquainted with my Ganus cousins, both past and present. As each person in our group has shared what they have or know about our family, each has given us something that can not be found in any document. Say what you want about Facebook.....but it's been the setting for a wonderful reunion. Stay tuned for more stories in the coming months! What Are You Crying Fer? It was a blessed time back in the day when extended families lived in close proximity to each other. Families were able to be part of each other's daily lives--- casually dropping in and out during the day, supporting and helping as needed. Not only were children able to learn some of life's most valuable lessons from their parents, but also from those that loved them most, specifically aunts, uncles and grandparents. Over time people have become more mobile and so for many, gone are the days when grandparents lived just down the road. Sometimes the "older folks" provided a very direct lesson in the form of "a talking to"---but other times, children learned a great deal from observing their nonsensical approach to life. Either way, those lessons often influenced many aspects of their lives by teaching morals, shaping attitudes and teaching skills to help them cope and deal with the day to day events. If shared with others, those lessons can continue to bless and shape future generations today . 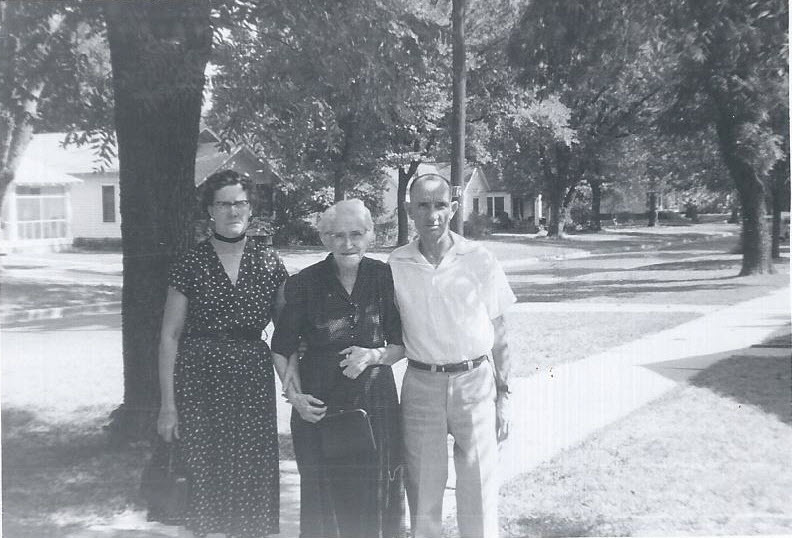 Phoebe Johnson was among those blessed to have lived near some of her extended Ganus family. 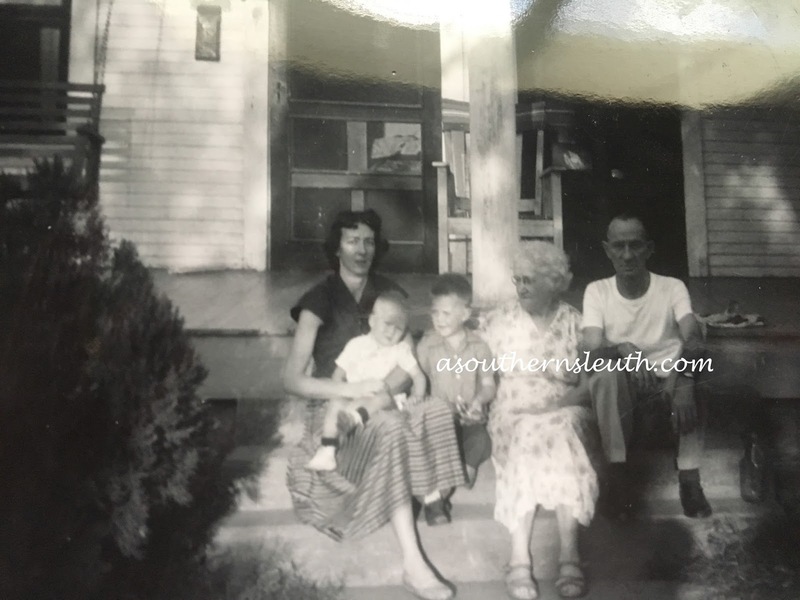 While she never knew her grandfather, Roderick Monroe Ganus who had passed away in 1932, she did know his wife, her Grandma Carrie Melinda Davis. Carrie was born 19 August 1886 in Hanceville, Alabama and was the daughter of Rolen Lee Davis and Mary Ann Watson. 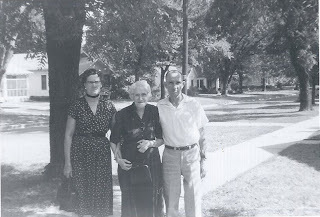 Roderick's brother, Bobby had married Stella May Montgomery, who was born 21 Jul 1879 in Missouri and was the daughter of Joshua Montgomery and Nancy Jane Woods. After the deaths of their husbands, Grandma Carrie and "Aunt" Stella lived in a duplex next door to each other. I am grateful for the following story that Phoebe recently shared with me. Not only has it greatly impacted her life and her children's lives, but I believe that sharing it will impact all who read it. Thank you Phoebe! "I remember the first lesson that I learned about death I learned from the death of Bobby's wife, Stella (whom I LOVED). Aunt Stella lived in a duplex along side Carrie. Aunt Stella was everything I wanted my Grandmother to be... patient, caring, touching and hugging. She was very loving. Then she died. I was visiting my Grandma, Carrie and I asked to go next door to say hello to Aunt Stella and she told me that she had died. It was probably the first time that I had realized loss through death and I was devastated. So I went out on the common back porch that they had shared and peeked in the windows of Stella's old house. Then I sat down on the porch and cried. Grandmother Carrie came outside and sat down by me and said in an exasperated manner "what are you crying fer?" I told her I missed Aunt Stella. She sat there for a moment and then replied "Well. Is that gonna bring her back?" I answered no and she said "then get up and find something to do". As a youngster, the logic of that appealed to me and has stood me in good stead for a good amount of time. The "Get up and find something to do and stop feeling sorry for yourself" theme is one I carry on today and my family knows that particular phrase well. Carrie was a no-nonsense gal and a little girl that had drama queen tendencies was no match for her. I am sure that being practical had its place in the days and times when my Grandparents were growing up and I cannot imagine the hardships they endured just to survive."